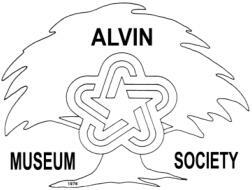 Bruce Taylor-Hille, Program Coordinator at the Brazoria County Historical Museum, presented the program at the August 27th meeting of the Alvin Museum Society. 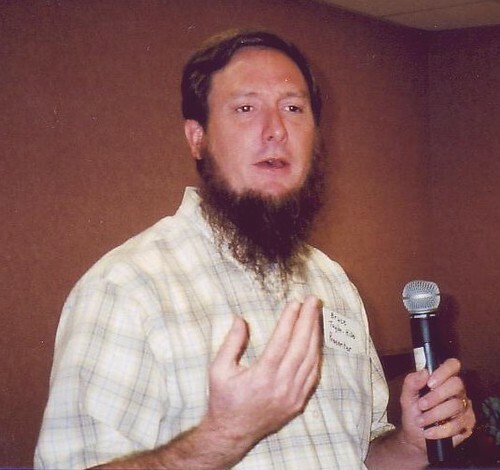 Bruce described the annual Austin Town celebration in Angleton and gave a detailed account of what life was like in the early 1800's. Austin Town is an open-air event which depicts a living history remembrance of life as it was when Stephen F. Austin mapped out Brazoria County. 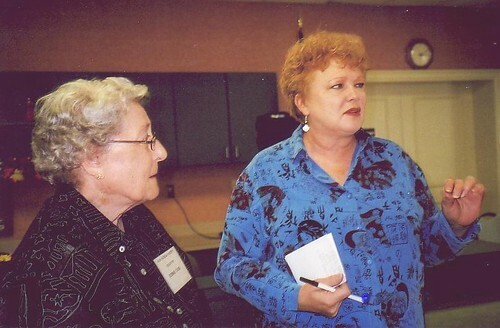 Bobbie Case discusses plans for the gala with event chairman, Julie Patterson. "Encore: Another Evening with the Stars" is set for November 11, 2006, at St. John the Baptist Catholic Church Parish Hall. Individual tickets are $50.00, reserved table for 8 is $500.00, available from Edward Jones/Bill Nelson, 281-388-0616 or Alvin-Manvel Area Chamber of Commerce, 281-331-3944. Festivities begin at 6:30 p.m. with social time, silent auction, seated dinner and entertainment. You don't want to miss this fun-filled evening! Get your tickets now.